Columnist Lori Weiman continues her series on brand bidding by discussing best practices for creating and optimizing successful branded PPC campaigns. Welcome to Part 3 of a series on PPC brand bidding, where I answer the biggest question facing PPC advertisers in 2016: How do I get meaningful growth numbers out of a crowded and competitive PPC market? Let’s get you all caught up. In Part 1, we reviewed how gains in PPC evolved over the years and why top-line revenue is so hard to come by today. Part 2 used data and case studies to explain just how valuable brand bidding has become to marketers. With the “why” now out of the way, it’s time to discuss the best practices of “how” to implement brand bidding campaigns. As with any PPC campaign, brand bidding begins with effective keyword development. There are plenty of primers on keyword selection and keyword research tools on the web if you need to review the basics. These definitely apply to brand campaigns, too. To start, find the brand and brand-plus keywords by reviewing your existing campaigns and analytics for generic terms that drive the best traffic. Then, add your brand terms in front of them (e.g., Burton + women’s snowboards on sale). Brand + product name (“Burton snowboard”). Brand + review (“Burton Snowboard review”). Brand + discount (“Burton discount”). Brand + sale (“Burton sale”). Brand long tail (“used Burton Process Flying V Snowboard 2016 157W”). Brand + website (“www.Burton,” “Burton.com” or “Burton website”). You can also check Google Autocomplete and related searches (at the bottom of the results page) for common searches on your brand. Competitors on your brand terms are there to steal your clicks and piggy-back on your good name. Competitors can cause you to lose clicks (See Part 2 of this series) and increase CPCs on your brand terms. Or worse, they can overtake you in rank, pushing you down the page. Your number one goal is to remove as many competitors as you can. The search engines will help you with this exercise. Start by familiarizing yourself with the engines’ trademark policies. The search engines have compliance departments that are set up to review your complaints. If an ad infringes on their policies, the engine will take the ad down immediately. If the ad does not infringe, the search engine will allow the ad to continue to run. If the latter happens, don’t take it personally. And don’t worry about getting penalized for this. Search engines expect some level of complaints and are prepared to handle your inquiries. If you can automate the reporting process, you should. The next best thing to a take-down is to beat your competitors in rank. You never want your competition to bid above you on your own brand terms, so it’s important to monitor your brand terms daily and adjust your bids accordingly. If your take-down attempts end up failing, it is most likely because the competitor is not using your brand name in its ad copy. By not using your name, the competitor’s ads are likely not very relevant to the search term, which will cause their quality score to decline and their CPCs to increase. Their costs will balloon as a result, which is what you want, since it allows you to outbid them. Sure, they could ignore return-on-ad-spend (ROAS) and continue brand bidding just to be jerks, but let them spend the money. You can also cause them additional pain by cranking up the heat with partner arrangements. If you sell online, having an affiliate program can help you dominate page one, drive more revenue, manage costs and build your brand. By carefully selecting a group of your best affiliates to work with you, you can use this powerful cost-cutting technique that can also boost clicks and sales. Identify a group of affiliates that you will allow to brand bid. In your contracts, clearly spell out that no affiliate can rank above you in branded PPC. Ensure affiliates have more relevant ad copy than your competitors by helping them to describe your products and services in depth in their ads and landing pages. As you mature the program, consider whether you should remove brand-bidding rights from all but your best three affiliates. This helps make sure your CPCs don’t get out of control. Affiliate management and coordination takes constant vigilance. (Sorry, there are no freebies in PPC!) This is accomplished with dedicated personnel and PPC monitoring tools that can automate the detection, reporting and communication with affiliates and the engines. Official Site. Consider using “official site” in your ad copy. An ad title like “Burton Official Site” can draw clicks away from wanna-be competitors and significantly increase your CTR. Landing Pages. Make sure your landing page is paying off what your searchers are being promised. Nobody likes clicking on an ad for blankets and getting a page for shoes — or even worse, seeing the dreaded 404 error page. Ad Extensions. Be sure to use ad extensions, specifically site links. Site links will make your ad BIGGER! Big ads take up more room, which pushes competitors down on the page. You can also add business phone numbers, third-party reviews (if you sell products) and display a local address if you have retail locations. I also encourage you to use call-out extensions to add offers, brand slogans or “official reseller” status. Offers. In a recent analysis of offers run in skin care ads over the Q4 2015 holidays, The Search Monitor found that 69 percent of ads mentioned free shipping, 22 percent mentioned a sale and six percent offered a free product. Highlighting offers like these can make your ad more enticing and potentially increase clicks as a result. Keep in mind that if you have a strong brand, and you can show your value in the ad copy, then you might not need an offer. Before you decide, evaluate the competitive landscape. Remember what Ricky Bobby said, “If you ain’t first, you’re last?” This is true with mobile, where only one or two paid ads (and often no organic results) can appear above the fold. You’d better focus on being #1. For example, here is a search on the Burton brand, and you can see only one listing. Burton makes use of site links, a phone number and an offer. Notice how BIG their ad is! The pole position is clearly good for traffic and conversions. Google recently announced that more searches take place on mobile devices than on computers. Our client and retail super affiliate, Savings.com, shares that on their mobile website, CTR drops from 30 percent in the first position to 12 percent in second position. Piggy-backing is a technique where you brand bid on a competitor’s brand name. I just spent most of this article discussing how to brand bid on yourself. Now, we will discuss brand bidding on your competition. Who can benefit from piggy-backing? Small Brands. Small, lesser-known brands can use piggy-backing to ride the coattails of a bigger competitor. Big Brands With Competing Products. If you are a big brand with a better product than your competitor, you can use this tactic to tell the marketplace about your superior products. Ad Copy. Do not use the brand in the title or description of your ad (You will get your ad taken down). Comparisons. Make sure that your ad is focused on comparing yourself to the competitor’s product or brand (in a legal, non-derogatory way). Display URL. Use their brand in your display URL. This will make your ad relevant, thus protecting your Quality Score (e.g., mydomain.com/yourbrand-vs-theirbrand). Landing Page. Make sure the landing page is targeted to the comparison that you espouse in your ad. It must thoughtfully and accurately compare your features and benefits. If you can, find a third party who has done the comparison for you. Here is a great example of this tactic deployed by Chevy against Ford to promote the differences between its Malibu brand and the Ford Fusion. Notice how Chevrolet is ranked first for “ford fusion?” The ad copy does not mention Ford. 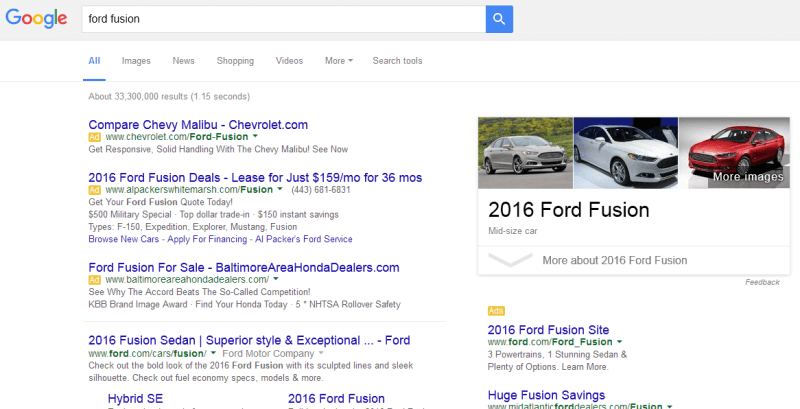 The display URL contains the Ford Fusion brand and takes the user to a comparison page. Okay, now let’s discuss another great example of piggy-backing. In the screenshot below, two giants of marketing automation, Marketo and Pardot, are battling it out in PPC. Marketo is advertising on Pardot’s brand name. Notice again, as in the above Chevy versus Ford example, how Marketo is ranked first and links its ad to a comparison landing page to make its case. If you were a smaller player in marketing automation (e.g., Net-Results.com, which markets on how it can compete with the industry leaders), you could be capitalizing on this same piggy-backing strategy. I hope you’ve seen that brand bidding is a carefully planned and executed battle that can be won by both large and small brands. By using the weapons discussed above, it’s possible to achieve meaningful growth from a crowded and competitive PPC market. For those of you who are more advanced here, I welcome your time-saving tips for newcomers. The next article in this eight-part series will dive deeper into maximizing affiliate/partner relationships for brand PPC. It will be followed by articles on handling the competition, legal responses to trademark violations, highly effective techniques and the future of brand bidding. Stay tuned!